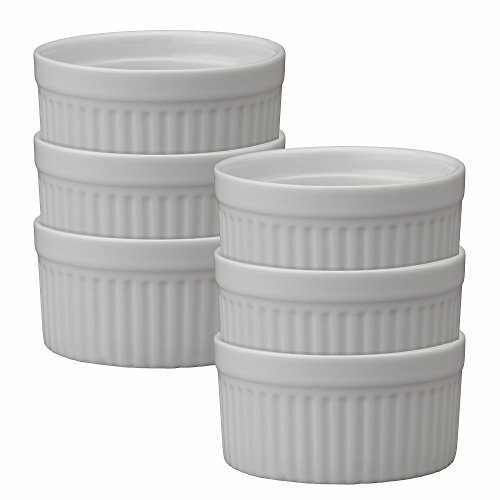 HIC Ramekins, Fine White Porcelain Souffle, 3.5-Inch, 6-Ounce Capacity, Set of 6 by HIC Harold Import Co. at Baking Love. MPN: 98005-6. Hurry! Limited time offer. Offer valid only while supplies last. HIC’s Souffle Ramekins are versatile baking dishes for making and serving appetizers, casseroles, entrees, desserts and single-serving recipes. HIC’s Souffle Ramekins are versatile baking dishes for making and serving appetizers, casseroles, entrees, desserts and single-serving recipes. Specially designed for use in the oven and under the broiler, they’re perfect for souffle and quiche, baked cocotte, mac and cheese, French onion soup, even blueberry crumble, apple crisp, peach cobbler, creme brulee and ice cream. They double nicely as serving dishes for garnishes, condiments, and seasonings, or dipping sauce, drawn butter, olives, taco toppings, and so much more. HIC’s Souffle Ramekins perform beautifully at every dining occasion, from breakfast to lunch or brunch, for holiday meals, party buffets, even outdoor entertaining. A tradition since 1957, HIC Fine Porcelain Bakeware and Serveware is safe for use in the microwave, oven, broiler, and freezer. These souffles are dishwasher safe, making cleanup a breeze. Set of 6 Souffle Ramekins. Manufacturer: HIC Harold Import Co. Publisher: HIC Harold Import Co. Studio: HIC Harold Import Co. If you have any questions about this product by HIC Harold Import Co., contact us by completing and submitting the form below. If you are looking for a specif part number, please include it with your message. BTäT - Ramekins 8 oz - Set of 8 Square, Porcelain Ramekins, Ramekins for Baking, Creme Brulee Dish, Souffle Cups, Appetizer Cups, Custard Dish, Pudding cups, Ramiken Set, Dipping Bowl.